Traffic Junky is a popular CPM-based digital advertising network. For almost 8 and a half years, they have conquered the networking market and maintained a solid reputation for providing quality service. They offer monetization solutions to both publishers and advertisers and best in class digital marketing solutions. Traffic Junky hold a CPM 90% cheaper than the Advertising giants, AdWords and Facebook ads. Traffic Junky initially gained its renowned reputation by partnering with only the top advertisers and publishers in the market. In fact, Traffic Junky deploys over 3 billion ad impressions daily and receives 150 million visitors on a daily basis. Nowadays, Traffic Junky is the most reliable online advertising network for publishers as well advertisers to promote their brands. The algorithm uses a smart CPM-bidding system to make the most out of the campaigns and helping clients to acquire the maximum profit. Advertisers can also bid for Traffic Junky’s ad spaces available on Publishing Websites. Choose the best ad placement for your brand products and gain reliable user traction. On the other hand, publishers can get attractive prices for their advertisement space. Therefore, Traffic Junky's bidding system is beneficial for both the parties, whether you’re a publisher or an advertiser. So, without any further talking, let's start the review of Traffic Junk Ad Network. TrafficJunky doesn’t require any advanced stats, so if you host a website with relatively good traffic, then you can apply to join the network. The sign-up process only takes seconds, and all you need to do is to fill a form. 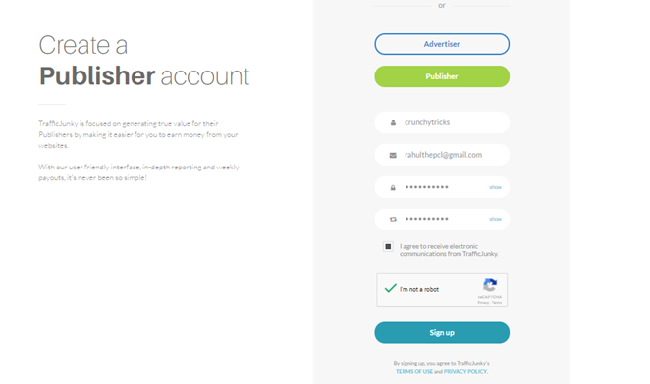 Sign up on Traffic Junky as a Publisher or an Advertiser. After submitting the form, you'll receive a sign-up confirmation email with the activation link inside. Once the account is activated, you can then submit your site for approval. Once your site is approved, then you can start displaying their ads on your website to earn money. For all the bloggers and publishers, Traffic Junky is an ideal monetization network. Just like with the preeminent and big sites, this ad network provides quality work to their every client. Since the network is solely CPM-based, publishers will get paid for each impression delivered on a weekly basis. Traffic Junky’s remarkable bidding system makes sure that publishers get the highest rates possible. This ad network has algorithms that rank sites by the number of clicks and conversions. In a nutshell, if the publisher’s site performs well, they will get better results too. So, you can get the most out of your platform. Additionally, the ad network’s enticing features include a provided in-depth analytical report, flexible payment options, weekly payout with a threshold of $50, and a highly-functioning referral program. Getting to the roots of why you should prefer Traffic Junky over other ad networks if you're the one who’s looking for an ad space to endorse your brand, product or any service. The one simple answer is the number of visitors and impressions you can engage. Moreover, If 150 million daily visitors aren't satisfying enough, then you should probably look for another ad network. Also, Traffic Junky works with the top publishing websites and premium websites around the world. So, the advertisers can choose where they would like to promote their brands. Meanwhile, you'll have a dedicated dashboard and an account manager who can assist you with any queries, or any doubts regarding the campaigns or the ad network. Traffic Junky offers a broad range of tools and optimized tactics to target audience from all over the globe. The support team can target visitors by time, keywords, location, device and time. Their primary traffic sources are from US, UK, and other countries. The CPM-bidding model works seamlessly right for both advertisers as well as publishers. The bidding advertiser selects the best traffic website for their ad campaign under the advertiser’s budget. 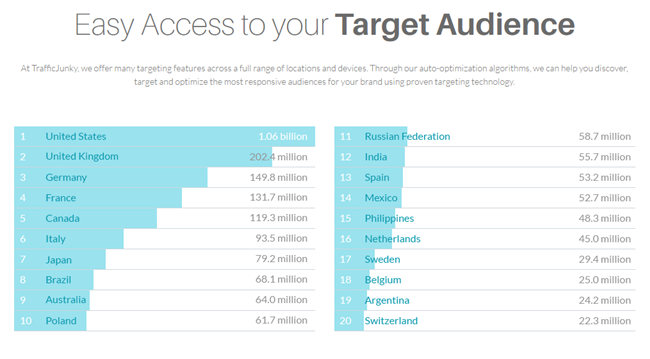 TrafficJunky also has the Geo-targeting ads solution, so if you're willing to target the audience from a particular country, city or region wise, you can do that easily. The campaign creating a feature on TrafficJunky is very easy to operate and work with. You get effective tracking option to check out the revenue and impression for website URL. Easily manageable dashboard and simple layout. Flexible bidding models (CPM) for both advertiser and publishers. 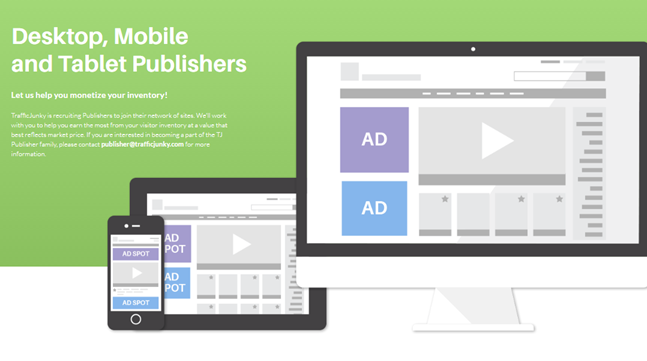 Detailed reports and analysis with dynamically tracking of your ads performance. Get Weekly Payouts from the ad network. Standard Payment options through PayPal, and transaction through International Wire transfer, Paxum, etc. Additional Referral Commissions up to 10%. TrafficJunky is limited to Banner Ads only; you can't get any popup or flash ads. One thing that I would like to mention that you're incapable of targeting particular ISP or demographics during your campaigns. All in All, TrafficJunky is really a very cost-effective, and reliable advertising solution based on the classic CPM model which suits every online business to advertise. 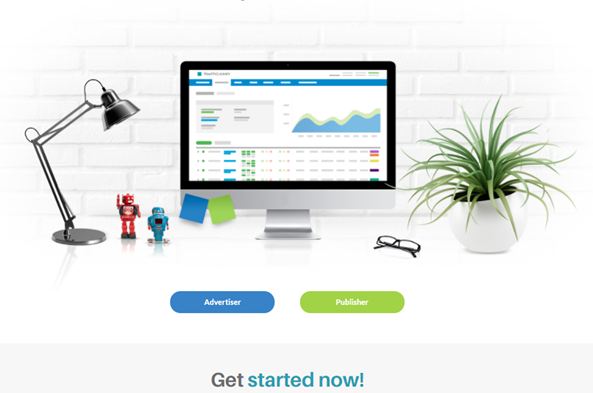 Also, if you are a publisher who wants to generate decent revenue through quality ads display on your website, then go with the TrafficJunky’s ad network. Do share your thoughts and let me know if you've successfully teamed up with this Ad Network in the comment section below. Cheers!